Training young scientistis with passion and interests to work for improving human life and health. 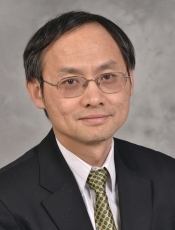 Dr. Liu has a long-term interest in understanding of molecular basis of psychiatric diseases. His laboratory participated in one of the bipolar genetics research consortiums and discovered the rare copy number variant (CNV) burden in early-onset bipolar disorder. His lab is one of the leading research groups on genome-wide study of postmortem brain gene expression and DNA methylation, pioneered in study of gene expression regulatory network in human brain. He established the methylation quantitative trait loci (mQTLs) in human brain, indicating that DNA methylation of some sequences could be highly regulated by genetic variants. His lab currently focuses more on understanding genomic and epigenomic mechanisms in human brains for psychiatric disorders. His research has been supported by NIMH, NARSAD, and Brain Research Foundation. He has published more than 100 peer-reviewed papers and several book chapters, and been cited for more than 7,000 times, with H-index of 37. He has served as reviewer for dozens of journals and foundations including NIH. Dr. Liu’s major research focuses on using a comprehensive approach that is composed of genetics, bioinformatics, genomics, cellular and animal models to identify the molecular mechanisms of major psychiatric diseases, particularly bipolar disorder and schizophrenia. Constructing multidimensional regulatory network in human brains, and relating that to etiology and pathology of mental illness is the major mission of this lab. Current major NIH-funded project is the psychENCODE project, investigating multi-dimensional biological features, networks in brains of bipolar disorder, schizophrenia and normal.